The works of Stano Masár (1971), majority of them being presented at the premiere of the exhibition at City of Nitra Gallery of Art - Young Artists' Gallery exhibition for the first time, belong all to one separate cycle. Until very recently, the cycle existed only in the form of conceptual works of the author's virtual studio as a variable and flexible system which, in the plane of technical parameters recording, had been waiting in fact for an opportunity to be implemented so as a creation intended for a specific space. Not by accident this characteristic method is bound to Masár's work - it namely commands an architectural quality, which enters through it the space but neither as its guest (a contrast) nor as a member of it (an organic part) but as a temporary intervention into it. Also the interior of the gallery that delimits the measures of exhibited works is a nurturing space for the site-specific installation; the staircase of the Young Artists'Gallery behaves in this case likewise as any other alternative space, so also Synagogue - Centre of Contemporary Art. 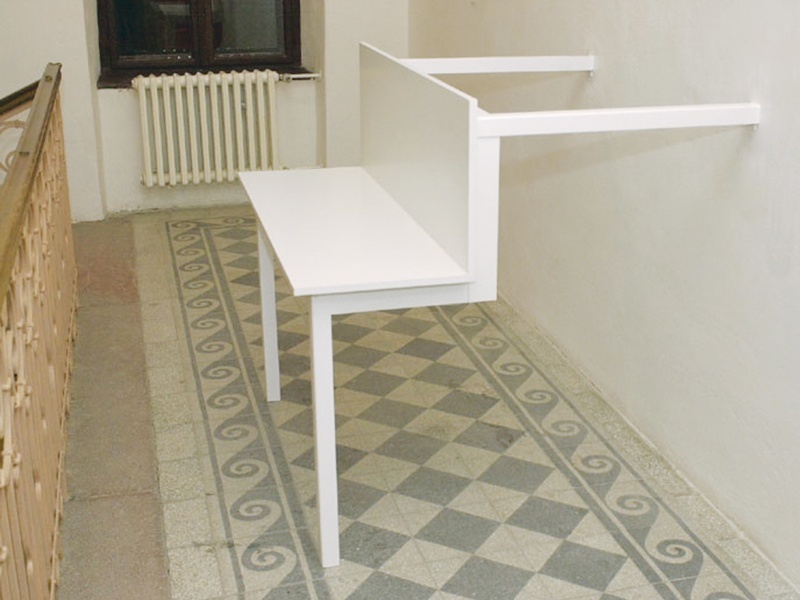 Eventual next, always to a certain extent relative, possibility of Masár's art objects presentation, belongs to a series of denials advised by the author's creation. Minimality of the form and schematicity of the basic (furniture based) accidence is the bearing binder of the whole series. It is quite usual that restraining formal aspects of a creation in this manner invokes, in the creative art, a counter-motion in favor of universality of the contents. However, Masár with the same great verve like he denies variability of forms, ignores also any contents-related plans and so - in a manner - he positions himself above the boundary points of artistic abysses: subjectless universalism and fatal fixation to the contents; both of them are, from the artistic point of view, absolutely irrevocable. The author makes no use of the detail and so the individual objects are basic form archetypes, thus they refuse form as such even to themselves - they only represent themselves by principle. Final controversy with the utilization is preceded first of all by the denial of design variation and innovation, denial of forms seeking, reduction to the narrowest boundary of formal logic. When this strictly specified strategy is violated a move occurs towards a play with reversed rules, a play against objet trouvé, hence to its produced and anti-functional version. Exactly by this procedure the objects acquire their own manner of life and their artistic defence. Important is that Masár brings motion into typological objects in that way that he assigns them properties of living substance able to modify its form according to situation. He achieves a notable effect by this: he preserves attributes of the original thing but he doesn't interfere with their purity of forms; even they are more pure in side the given disproportional metamorphosis (in one instance they are for example more planary, in another one they are, on the contrary, more spatial) and, at the same time, dynamic to the maximum degree. The manner this play is performed has its rules and constraints: one margin is the closeness of the object and so the thing is cold towards its surround, the second is usurpation of the space in a version of some intuited previous action that has been carried out before we arrived - therefor again perception of cold but this time as an ex post effect. Basically we speak about various nuances of deconstruction as a construction method that in the Masár's angle of view acts as a new interpretation of traditional reality. Its boundaries and its platform are at the moment luckily given and it depends on the author alone how much he will enrich this precious foundation and how much he will develop it and make it contentsfull. Richard Gregor, curator of the exhibition Translated by Peter Stach The premiere of the exhibition was realized in City of Nitra Gallery of Art - Young Artists' Gallery (Galéria mladých) in October 2001.